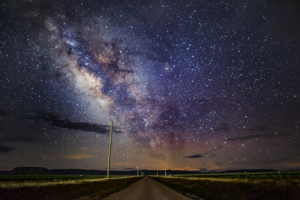 The “Dark Skies New Mexico” photographers are Alan Osterholtz, Brian Spencer, Michael Littlejohn and Jose Sandoval, all hobbyists who have professional credits to their names. Alan has had his photos featured in a National Parks publication. Several local news outlets have featured his photos, along with photos from the rest of the group, during monsoon season when lightning abounds. Michael has been part of a Dark Sky campaign for the National Parks locally as well. Brian is known for his time-lapse work and is a favorite among local models for fashion shoots. Jose has gained a lot of knowledge and experience from working with these gentlemen. Together, the group tries to meet up at least once or twice a year to go shoot the Milky Way in various parts of New Mexico. They have a common bond with their work, which tends to be a passion at times. All have worked hard to be where they are with what they have for equipment, and they will continue to be a group of record keepers for the night skies here in New Mexico and the various places they visit in their travels.